For awhile, I’ve wanted to get NHL into role playing games. I’ll admit that I’ve had limited experience with them myself, but they seemed like a fun activity to share with NHL. 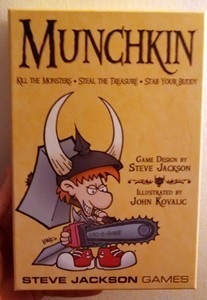 Meanwhile, I had heard of a RPG-like game called Munchkin. Many people on Twitter spoke highly of it and I even had the pleasure of interacting with John Kovalic, illustrator of the Munchkin cards (not to mention the wonderful Dork Tower). Over the weekend, I had a chance to show NHL a few episodes of Tabletop with Wil Wheaton. For those who don’t know, Tabletop is a web series where Wil Wheaton and three guests play various games. The show is funny and entertaining, but I’ve found it helpful to see which games my boys and I might like. What better guide to see how my boys might do with a game than watching other people play it? NHL and JSL had already seen part of one episode and, after seeing it, wanted to get Qwirkle – the game they played. Over the weekend, though, NHL saw the Munchkin episode. He was fascinated with this game where you got to kick in doors, fight monsters, and get treasure. The next day, while shopping, NHL decided to use some money that he had to buy the game. During our first game, NHL won handily and his love of the game was cemented. We played a second game and though he lost, he still had fun. 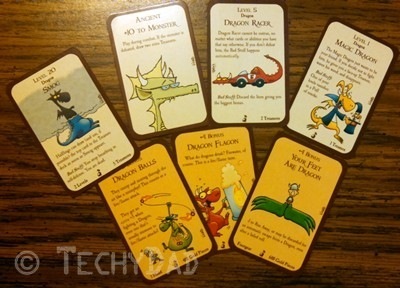 Since then, he has not only made additional Munchkin purchases (some spinners to keep track of levels and a Munchkin: Dragons expansion pack) but has played the game every available moment. He has not only played with his brother (who – being only 7 – might not fully understand the rules of the game), but has played a variant he made up to play by himself. I’ll admit that there are some elements of the game that aren’t 100% child friendly. 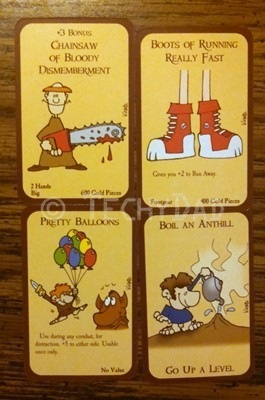 Some of the cards rely on crude humor which can inspire the boys to inappropriate behavior. Other cards reference sexual humor (for example, the "kneepads of allure"). I’ve found, though, that the crude humor can be dwarfed by much of what can be found on so-called kids TV. (One commercial for a show we don’t watch involved a character continuously passing gas. That was essentially the entire segment. The show’s calling card.) At least the humor in Munchkin, though it can be crude at times, has a more intelligent base to it. As for the sexual humor, that tends to go over the heads of my boys. However, if it is a problem, the few cards that parents find objectionable could easily be removed from the game without damaging gameplay. Our previous gaming experience – Settlers of Catan – hasn’t panned out like I hoped. Part of the reason for that is that Catan can take awhile to play. If bedtime arrives, we might need to either end the game or somehow move the game (while preserving the exact state of the board) until we next play. Munchkin, however, takes about an hour to play. 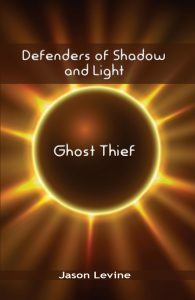 If it is somewhat late at night, we can even speed things along by promising not to backstab each other and helping each other fight strong monsters – speeding everyone along to level 10. 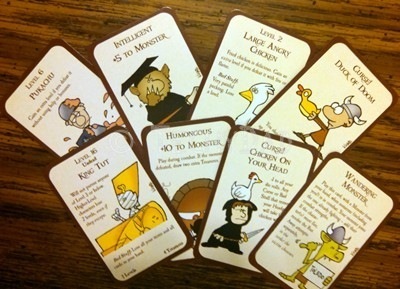 Munchkin definitely seems like a game that we can play over and over. Even if the game gets slightly repetitive (not something I see happening any time soon), there are enough expansion packs that we could mix into the game to spice things up. In short, I see many doors being kicked down in the future. Now, if you’ll excuse me, there’s a Level 6 Shrieking Geek I need to take care of with my +3 Chainsaw of Bloody Dismemberment.